Redesigning your kitchen or bathroom space can reinvigorate it from drab to beautiful. Let Phoenix Flooring be your remodeling experts to create a vibrant and unique room. 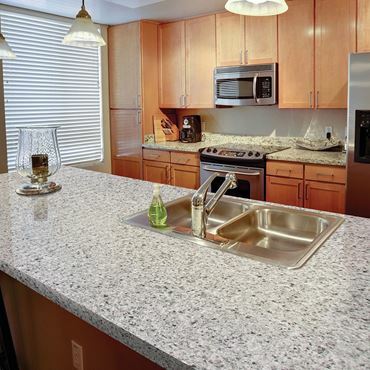 Coordinate everything from style, color, and materials for your new countertop installation. Whether its from existing damage or just a much needed aesthetic update let your community Phoenix area countertop install team get the job done for you. With Phoenix Flooring you can be sure you are getting more than just a simple floor installation. Coordinating with multiple professionals we are able to do an entire redesign project from flooring, cabinetry, hardware, and countertops. We have products that are of the highest quality yet affordable that will ensure your enjoyment for many years to come. Our countertop experts are trained in the latest techniques along with a respectful attitude. Call today at 602-344-9997 if you have any questions regarding countertop installation or floor redesign – or visit your Phoenix countertop company to speak to our friendly professionals to discuss what your options are.